First and foremost, I’m really creeped out that the dude who made the ouija board in the first place was from Baltimore. Did anybody else know that? Second and a little less than foremost, I went to a school with a Fuld. Third and most foremost, I’m really digging here in the old memory bank to see if I ever said or did or wished anything negative toward good ol’ Nancy. If I did, may this serve as the apology to trump all apologies. Nancy, please don’t ouija me. Please. I am a beggin’ ya. Down on my hands and knees I am. I promise I’ll undo the mean, hateful middle-school things stupid boys do to girls. Promise like I’ve never promised before…. Ok. The real deal is, I heard this little line out of one of Sheryl Crow’s songs (shock! I know! )–you know, the song that says a change’ll do ya good, and it got me thinking about Carl’s challenge, the serendipity of the blogosphere and love and all that good stuff, and how we’re all connecting on a level that we once thought to be truly mysterious and outright terrifying. Do you remember the first time you tried out the ouija board? Sister’s room, with her friends, and I was the little tagalong. They had lights out, maybe a candle or some nightlight making everything all spooky, and they’d ask the board a question, and there it’d go. That little pointer thing would zip around that board so fast with the answers nobody knew what to think. We were too young to think of things like power of suggestion or the sheer will or desire to create a little drama in the dark. To us, that ouija board was connecting us with somebody we knew nothing about in a world we’d never visited. Kinda the way I feel about a lot of you out there. Here I am, blogging away, chatting with so many of you as if you’re across the street–no, even more intimately–and yet there’s a mysteriousness to it all. There’s a stir of the dark (in the sense of the unknown) side that, until now, I never realized. Isn’t it true, though? Online, we become a little closer to our true selves, we reach out to each other and the responses we get are often deep, startling, genuine. When we were kids we longed to ask the deep, dark questions about life and have them answered. Now that we’re older, we get to do it all over again, but this time, we don’t seem as surprised when we get a response. We embrace it. We reciprocate with more questions, more genuine words that capture the soul of who we truly are–often surprising ourselves because we’ve been in a machinistic, plastic way for so long. We’ve learned to put on the layers to protect ourselves. We’re afraid to say what we really think about others, about the world, about ourselves. And so we become cordial clones of an image of what the world believes we should be to promote a peaceful and gentle people. I say we all get on our ouija blogs and continue to step out. I embrace individuality, not cloning. I wanna continue to hear the you in your words and not what everybody else wants you to say. We do enough of that in our day-to-day business. 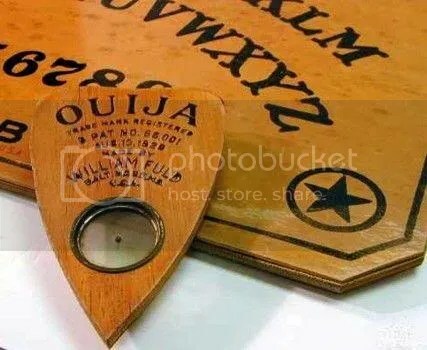 I want to think that, if I were to ask ol’ ouija right now if there’s a genuine connection between us all that transcends that rather traditional How-Do-You-Do, I’d get a quick shot up to Mr. Sun in that top left corner, where Y.E.S. awaits. And while you’re at it on the board, ask if Nancy and I are ok. I just can’t muster up the courage to put that one to ol’ ouija right now. . . .
Are you and Nancy ok? One Halloween, some friends and I decorated the house with all manner of spooky and kitschy decorations, including a really cute vampire that rose up out of a coffin to scary music whenever anyone passed by. Sadly, even tho I’d put new batteries in it, it was quite old and didn’t work anymore 😦 so I put it on the stairs to remember to take home with me that night. After playing bones, we decided to go buy a Oiuja board…spur of the moment, as my friend couldn’t find hers. We set it up, and each of us were going to ask a question. The first person asked the question and … as might be expected … there was much giggling and obvious pushing of the planchette. Then, the next person asked to talk to her grandfather…and all hell broke loose! We felt a cool breeze where there should’ve been none, and when my friend asked the guestion of her grandfather, the planchette began to move…fast. Not only was her grandfather there…but her older brother who’s passed away when she was 12. She began to cry but kept asking questions, which were all answered. Then her grandfather said goodbye…and the broken toy, the vampire that rose out of the coffin…started to work. All by itself, down on the stairs. I believe in spirits of those who have passed and yes I believe in reaching out. I love meeting new people. But I will never ever play with an Oiuja board. I will go to a psychic and even a medium but never do I play with the Ouija board – for some reason it just freaks me out too much. I’ve always avoided Ouija boards, because a couple members of my extended family had creepy experiences. I’m superstitious enough that I never want a Ouija even in my house!